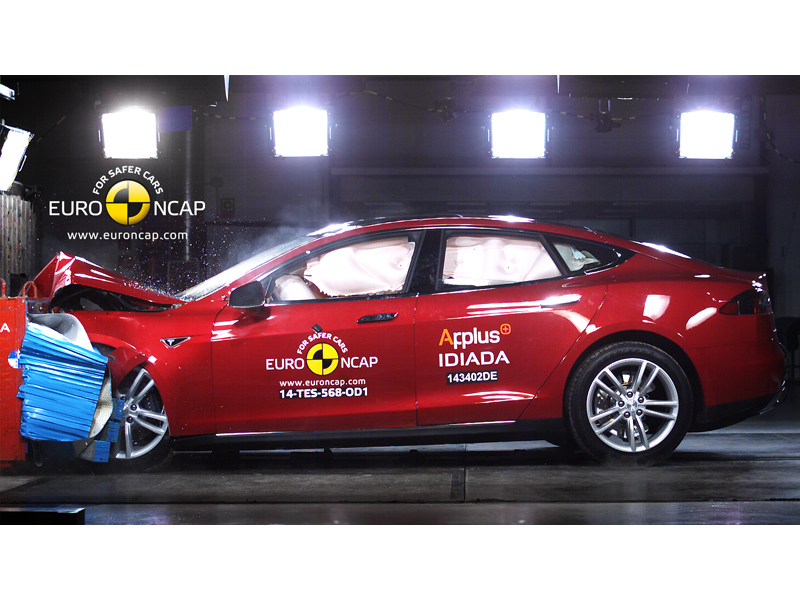 Tesla Model S has been awarded 5 start safety rating under NCAP (New Car Assessment Program). Tesla Model s was previously crowned as the ‘best crash test ratings in the history of accident testing’ by NHTSA (National Highway Traffic Safety Administration) last year. the vehicle has been rated 5 star in crash test both in the united states as well as in Europe. This is the most toughest car safety test in the world and achieving 5 stars is worth an applaud. Since the Model S has been on sale, there’s been “only” one publicized death in a Model S. There are just a handful of cars that have passed with 5 star rating from both NCAP and NHTSA. Tesla model S has structural advantages over the other cars that it is able to achieve such safety ratings. The electric drive-train being situated under the passenger compartment causing low center of gravity with almost no chance of vehicle roll over. With the body being reinforced with aluminum extrusions, it has a structural rigidity that other vehicles are not capable of. NHTSA test focusing on structure, restraint, and impact absorption, particularly of adult passengers. Where as NCAP tests are broader in scope and variety, utilizing both adult and child crash test dummies of varying weights to determine more precise safety ratings. The NCAP test also places a special emphasis on active safety features like lane departure warnings.